Chi li riparerà in futuro? Testi scritti da esperti di orologeria svizzera, letti e approvati dai marchi e tradotti in 6 lingue. Salva le ricerche e conserva i tuoi orologi preferiti, crea la tua collezione! I giornalisti e i blogger accreditati possono accedere alle immagini in HD e alle cartelle stampa dei marchi. 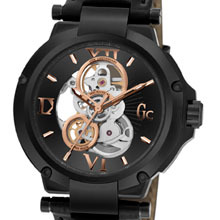 Gc takes pride to introduce a new sophisticated Limited Edition Swiss Made mechanical watch with skeletal movement to celebrate its 15th anniversary. In this new timepiece, traditional Swiss savoir-faire meets bold and expressive design, perfectly translating the Gc brand characteristics. The finely etched mechanical ETA 2801 movement is visible through four interconnected circular openings on the dial or through the transparent case back. A strong statement of modern Swiss watch making. The Gc-4 15th Anniversary Limited Edition timepiece exudes the Gc passion for remarkable design with utmost attention to detail combined with the beauty of Swiss craftsmanship. The striking 44 mm case with tapered lugs and the beveled bezel with decorative screws set the sporty elegant frame for the finely chiselled skeleton movement, and the sophisticated cutout dial. A black sunray detail around the openings features hand-applied roman numerals and indices smartly putting into focus the inner beauty and life of the watch. The movement with 17 jewels features a 42-hour power reserve and offers standard time indication with central hour, minute and second hand, coated with SuperLuminova®. The annular balance oscillates at 28,800 vibrations per hour, precisely setting the pace of this outstanding Gc timepiece. The timepiece is equipped with a scratch-resistant sapphire crystal as well as with a transparent sapphire crystal case back. The crown with embossed Gc logo and the screw down case back offer water resistance to 50 meters (5 ATM). It is available in 115 limited and numbered pieces making it not only a highly qualitative but also a highly exclusive anniversary piece. One of the highlights for Baselworld for Gc and a true signature style for the brand in its colour combination is the all-black matte PVD model with intriguing rose gold accents. The hand applied indices and hour hands shimmer in stylish rose gold on the cut-out dial. The dial opening at 12 o’clock carries a 15th anniversary engraving on the rose gold rim. The total all-black look model is completed by a black croco-embossed Italian leather strap with a two-side pusher deployment buckle engraved with a Gc logo. Besides this highlight piece, this series consists of two other executions, one with a black PVD case set against a brown dial and brown croco-embossed leather strap and another with a brushed and polished 316L stainless steel case with silver dial and black croco-embossed. A powerful Smart Luxury statement of Swiss craftsmanship to celebrate Gc’s 15th anniversary.